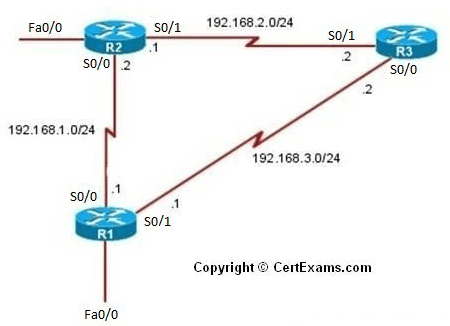 Description: The purpose of this exercise is to configure EIGRP on all the devices and test for ping and trace commands. The router eigrp 0 command given in the lab below selects EIGRP as the routing protocol. The network command assigns a major network number that the router is directly connected to. 4. Configure the IP address as 192.168.1.1 255.255.255.0 and enable the interface status. 6. Configure the IP address as 192.168.3.1 255.255.255.0 and enable interface status. 7. Choose Router > Dynamic Routing select EIGRP from the protocol list and click Edit button. 8. In the Edit IP dynamic routing window enter Autonomous System Number as 0 and click add button to add a network. 9. Enter 192.168.1.0 as network address and click OK button. 10. Click Add button again in Edit IP dynamic routing screen and enter 192.168.3.0 as network address and click OK button. 11. Select R2 from Select Device drop down box. 12. Repeat steps 2-10 for configuring R2 S0/0 interface ip address as 192.168.1.2 255.255.255.0 and S0/1 interface ip address as 192.168.2.1 255.255.255.0 and network addresses 192.168.1.0 and 192.168.2.0. 13.Select R3 from Select Device drop down box. 14. Repeat steps 2-10 for configuring R3 S0/0 interface ip address as 192.168.3.2 255.255.255.0 and S0/1 interface ip address as 192.168.2.2 255.255.255.0 and network addresses 192.168.3.0 and 192.168.2.0.